Entwurf eines zweisitzigen Nachtjägers. Entwicklung wurde früh aufgegeben. In the aftermath of the Second World War, Britain identified a threat posed by the jet-powered strategic bomber and atomic weaponry and thus placed a great emphasis on developing aerial supremacy through continuing to advance its fighter technology, even following the end of conflict. In early 1947, the British Air Ministry released one request for proposals to the country's aviation industry. The specification "F.44/46" called for a two-seat night fighter, that would intercept enemy aircraft at heights of up to at least 40,000 feet. It would also have to reach a maximum speed of no less than 525 kts at this height, be able to perform rapid ascents and attain an altitude of 45,000 feet within ten minutes of engine ignition. 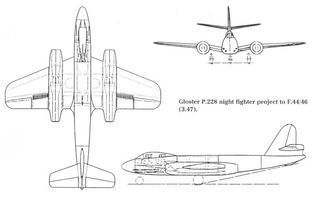 The Gloster company submitted the "P.228" design in response to the requests. The P.228 night fighter was essentially an evolved derivative of Gloster's classic Meteor day fighter. The Gloster P.228 had an orthodox tail and fin and four 30mm cannons in the lower fuselage. A Sea level rate of climb 10,700 fl/min (3,261m/min) with 11.25 minutes needed to reach 45,000ft was planned for this aircraft. This project was abandoned in fovour of more advanced delta wing project P.234 and P.238, which resulted at the end in the Gloster Javelin.